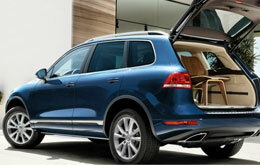 The Touareg is a triple threat of efficiency, affordability and utility. For families and for fun, the latest incarnation of this award-winning SUV delivers increased horsepower, advanced safety technologies, and an abundance of comfort, convenience and infotainment amenities. With a diverse set of trims, including the world's first supercharged gasoline hybrid SUV and TDI Clean Diesel models, VW Touareg shoppers in Orlando can find a model perfectly suited for their needs. And with a highly attainable base MSRP, prospective buyers will also find that this SUV fits perfectly within their budgets. The 2014 VW Touareg is available in Orlando in several lavishly appointed trims, starting with the VR6 Sport, VR6 Lux and VR6 Executive. Shoppers can also select from Touareg Hybrid, Touareg R-Line and three diesel trims: the TDI Sport, TDI Lux and TDI Executive. You can find all of the aforementioned trims in arresting colors like Toffee Brown, Night Blue, Canyon Gray, Dark Flint and more. The Touareg comes well equipped with a long list of standard features including: Bluetooth for easy hands-free calling, dual-zone automatic climate control to ensure you travel comfortably in all kinds of weather, and an iPod and satellite radio integrated touchscreen stereo system that delivers entertainment on every journey. You can also find the perfect seating position with eight-way power adjustable heated front seats, which are also standard, along with many other features. In our 2014 VW Touareg review, the engines were the standout feature. The first is a 3.6-liter V6 that generates 280 horsepower and 265 pound-feet of torque, and comes standard on VR6 models. TDI trims get a clean burning 3.0-liter turbodiesel V6 that produces 240 horsepower and a whooping 406 pound-feet of torque. The TDI has a range of more than 700 miles on each tank of ultra-low-sulfur diesel. Last but not least is the Hybrid's cutting-edge gas-electric powertrain, which combines a supercharged 3.0-liter V6 with direct injection and an electric motor. Together the pair pumps out an impressive 380 horsepower and 428 pound-feet of torque. The Hybrid packs the punch of a V8 with the fuel efficiency of a V6, making it a smart choice for saving fuel, money and the environment. If you've ever thought about purchasing vehicles like the 2014 Mercedes-Benz GLK-Class, Lincoln MKX and the BMW X5 in Orlando, compare Volkswagen's new 2014 Touareg first; we're condifent that it's perfect for you. 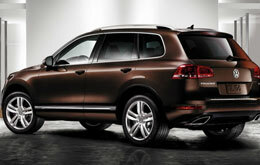 The Touareg's got several winning attributes, including its progressive cabin features and handsome styling. For Orlando Volkswagen customers who want a remarkable value, just compare this vehicle's price to the vehicles in its class and you'll see that it's a worthwhile investment. Find out more information about what it offers in our bullet list below this paragraph! 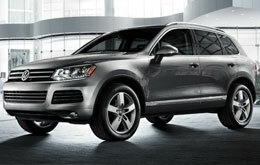 For reviews of the 2014 Volkswagen Touareg and older models, David Maus VW South is your trusted resource. We're a foremost car retailer in Orlando for a reason, part of which is that we provide reviews transcribed by well-informed writers who are at the height of their craft. The above article is crammed with worthwhile facts - it contains info about fuel economy and other specs so that you can make smart decisions about the Volkswagen you want to buy. Is the Touareg not the right choice for you? Discover more about other vehicles available at David Maus VW South using our reviews index. 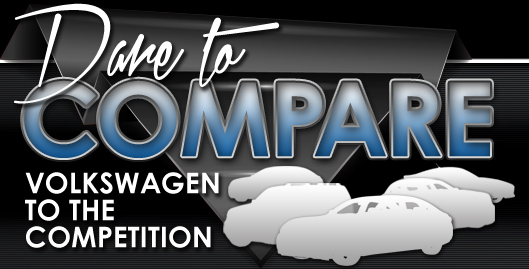 With it you can review and compare Volkswagen's entire selection of vehicles.